Documentation: Specimen: UNSM ZM12694, 21 May 1895 Lancaster Co. There are earlier reports 28 Feb 1981 Washington Co (Williams 1981), and 4 Mar 1992 Scotts Bluff Co, and later reports of an injured bird 20 Jun 2013 at Lake McConaughy, Keith Co, and seven on 21 Jun 2005 Lake McConaughy. Most arrive in the latter half of Apr; peak counts are in May. 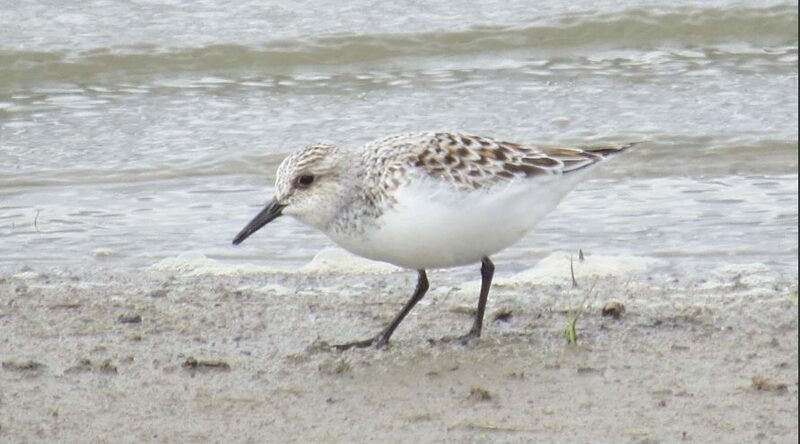 Sanderling plumage is variable in spring due to molt and sexual dimorphism (Macwhirter et al 2002). High counts: 372 at Lake McConaughy 15 May 2003, 193 there 16 May 2005, and 142 there 14 May 2004. Adults generally arrive during the third week of Jul, although the earliest arrivals are probably failed breeders, which depart breeding grounds in late Jun (O’Brien et al 2006). Adults are rather uncommon in Nebraska and usually do not remain for extended periods. Juveniles arrive during the latter part of Aug and comprise the majority of birds reported thereafter. Fall numbers are lower than those in spring. High counts: 179 at Lake McConaughy 14 Sep 2007, 157 at North Platte NWR, Scotts Bluff Co 10 Aug 1994, and 108 at Lake McConaughy 21 Sep 2000. Comments: The number of Sanderlings observed during migrations in Nebraska has increased, probably a result of reservoir construction and new lakes providing (at least at times) extensive sandy shorelines that attract this species. Previously, sandy shoreline habitat was limited to river sandbars and some Sandhills lakes; Tout (1947) did not have any Lincoln Co records until the construction of Lake Maloney.